Register for Asian American Studies, NOW. First year in college? Back to campus? If you haven’t registered for Asian American Studies here are 3 reasons why you need to NOW. It’s the ultimate “life hack” for Asian Americans. The struggle for Asian American studies can be considered the original “life hack” for Asian Americans. If we think of “hack” in its earliest iterations, that is, to “use a computer to gain unauthorized access to data in a system,” the “hack” performed by the San Francisco State Asian American students fighting for Asian American studies was about gaining what was practically “unauthorized access” to the university system. Though Asian Americans are now considered a “model minority,” in the late 1960s, Asian Americans suffered from racist exclusion from colleges and universities like other people of color. The children of low-wage immigrant families, Asian Americans lacked representation in institutions of higher learning. The strike not only led to the establishment of Asian American studies, it also successfully opened up the admissions process for minority students through the creation of programs like affirmative action. Asian Americans have benefited tremendously from these struggles for increased inclusion, though most of us think we got into our college or university of choice because we’re hard-workers or really smart. Yet even the best and brightest and most diligent Asian American students just a few generations ago were denied admission to those same colleges and universities. That’s why I think the struggle that led to the establishment of Asian American studies is the ultimate life hack. If the term life hack is defined today as, “a tool or technique that makes some aspect of one’s life easier or more efficient,” then access to higher education is a fundamental “life hack” since a college or university degree offers us a wide range of privileges. Another way of thinking about Asian American studies as a life hack is that it provides us with an understanding of how to navigate (and challenge!) life in a racist, white supremacist society as people of color. This leads me to my next point. It offers greater knowledge about our collective experience than a Buzzfeed-like listicle or vine. Asian Americans have come to dominate social media and other Internet media platforms like You Tube. Ryan Higa and Michelle Phan, for instance, have millions of followers. To their credit, others like the Fung Brothers actually try to offer basic analyses of Asian Americans’ experiences as racialized minorities in this country. The problem is, however, that analysis is superficial, Asian American scholarship has flourished for over 40 years. It has addressed a wide range of topics with substantial, critical analyses that examine how the economic, political and cultural structures and institutions in American society have shaped our experiences as group. It goes without saying (or maybe we don’t say it enough) but you need to read a book (or academic journal article) and not just a series of bullet-points or watch a comedic vine to fully understand what it means to be “Asian American”. Before using the hashtag, think about looking at the index or bibliography of an Asian American studies text to locate well-researched information on topics relevant to our community. What you learn through Asian American studies scholarship, for instance, is that the stereotypes attributed to Asian Americans have changed historically, and that these stereotypes are constructed alongside and against stereotypes of other racialized minority groups. What this means is that these stereotypes are complete fiction and were created to foster divisions between us and other people of color. These stereotypes are meant to uphold the white supremacist, profit-driven society we may not always like to admit is the society we live in. For example, Asian Americans were the first immigrant group to be considered “illegals.” It was thought that we threatened (whites’) jobs and posed a cultural threat to American society because we could never assimilate. Sound familiar? These ideas were used to justify the labor exploitation and residential segregation of Asian immigrants from the late nineteenth century to the mid-twentieth century. More recently, with increasing immigration from Latin America, these ideas have been retooled and used against Latinos. 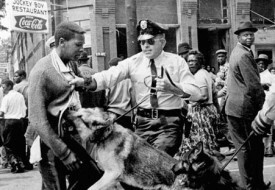 Meanwhile, as the United States faced international criticism for Jim Crow racism during the Cold War, and as the civil rights movement gained momentum in the late 1960s, the negative stereotype of Asians was reversed. Asian Americans all of a sudden became a “model minority.” The successes of a few were used to undermine anti-racist struggles being led by African Americans across the country. If Asians could thrive in American society despite experiences of racial discrimination, according to the “model minority” myth, then all racial minorities can thrive. Why change the system? This false logic, however, masks the deeper social structures that reproduce a veritable caste system in what is supposed to be a democracy. Asian American studies provides us with this historical perspective and challenges us to look beyond a present-ist perspective (i.e. a perspective that is only focused on the present, the now, the instant and immediate). Asian American studies, however, was never meant to only provide critical and historical analyses of the power structures that shape our lives. It was meant to provide knowledge for social transformation; to provide us with tools for challenging the system. Asian American studies offers us education for us, by us, and not for the corporations that have too much control over higher education and that you’re likely to have to work for to pay off your debts, ironically, after you graduate. Asian American studies has been documenting our stories and speaking truth to power for decades well before #MyAsianAmericanStory became the phenomenon it has become today. Though #MyAsianAmericanStory is a worthy endeavor it doesn’t really give us the tools for understanding why our stories have been suppressed to begin with. Asian American studies does. The prominent African American intellectual W.E.B. Dubois is often quoted as saying, “The probem of the twentieth century is the problem of the color-line” in describing how white supremacy is a foundational logic organizing American society. However, in other places he in fact writes, “The problem of the twentieth century is the problem of the color-line—the relation of the darker to the lighter races of men in Asia and Africa, in America and the islands of the sea.” For DuBois, white supremacy is a struggle against which all people of color share common cause. This sense of common cause motivated the various groups that came together the Third World Liberation Front on the San Francisco State University campus. The generations of students who have benefited from their struggle for Ethnic Studies, including Asian American studies, have cultivated this same sense of common cause and solidarity. They’re the ones taking a lead in supporting #BlackLivesMatter as this picture of some of my former students demonstrates (it’s the first image that pops up when you do a search of “Asian Americans and #BlackLivesMatter”). 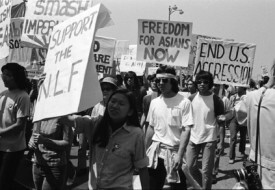 The values that animated the Third World Liberation Front and that led to the creation of Asian American Studies are still very much needed today: interracial solidarity and a commitment to ending war and militarism. Do yourself a huge favor this academic year: take Asian American studies. Your life, whether you realize it or not, depends on it.